The tragedy of a typical American - a salesman who at the age of sixty-three is faced with what he cannot face: defeat and disillusionment. Death of a Salesman is considered by many to be both the playwright's masterpiece and a cornerstone of contemporary American drama. Miller's work is revered for its bold realism and riveting theatricality, a play that deals in weighty emotional issues without descending to melodrama. Review copy provided by L A Theatre Works. PUBLISHER'S SUMMARY: Stacy Keach and Jane Kaczmarek star in this 1949 masterpiece by Arthur Miller, a searing portrait of the physical, emotional, and psychological costs of the American dream. Willy Loman (Keach) is the play's iconic traveling salesman, whose family is torn apart by his desperate obsession with greatness and social acceptance. As his two sons cast about aimlessly for their station in life, Willy begins to come unraveled when the reality of his life threatens his long-cherished illusions. 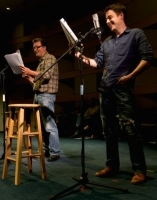 Copyright 2011, L.A. Theatre Works. AUDIOBOOK REVIEW: For forty years, Willy Loman was a traveling salesman. All his life, he had dreams of being somebody important; someone that everybody liked and respected. As his two boys, Biff and Happy, were growing up, he tried his best to inspire them to greatness. But somewhere along the line, it all went wrong. After forty years on the road, Willy finds that he is not respected at all. Rather, people see him as a foolish old man. The dreams that Willy had for Biff and Happy never came true either, neither of them able to climb out of their low-echelon jobs. Willy wanted the American dream, and at the age of 60 it mystifies him to think how it never worked out, while others seem to come by it so easily. When I was in high school, we read Death of a Salesman and watched the video too, but I didn't get it. How could a teenager who knows nothing about the world be expected to understand the struggles and frustration of the middle-class working man? Now that I am a bit older, I understand it perfectly well, and listening to the play again nearly brought me to tears. Trying to live up to his own high expectations broke Willy Loman, and as his sons tried to live up to Willy's expectations, they broke as well. This is a very disturbing look at the darker side of the American dream. Death of a Salesman is a full cast audio production, complete with music and sound effects, and I have to say L.A. Theatre Works did a masterful job. The voices in Willy's head, and the flashback scenes, are layered in beautifully. L.A. Theatre Works has come up with a certain way of doing that so you can always tell when reality begins to slip away from Willy a bit. Stacy Keach and Jane Kaczmarek gave incredibly powerful and moving performances in the lead roles, and the rest of the cast was excellent as well. It's probably a good thing the running time is only 2 hours, because once I started, I just couldn't put it down. I admit that I was reluctant to review this title. Live theatre has never really been my thing. I'm very glad that I finally did it, though, because I enjoyed it very much. It's like I always say, if you never read outside your favorite genre, you're going to miss out on some really great stuff. Trond, thanks for insisting. According to the L.A. Theatre Works website, Steven's latest radion play "Death of a Salesman" will be broadcast as an abridged version on Oct 1, 2011 at 6 pm PT. 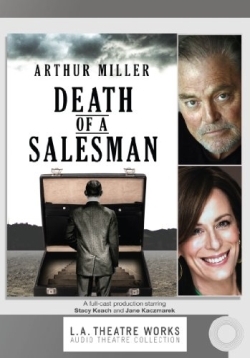 "Death of a Salesman" by Arthur Miller. Starring Stacy Keach and Jane Kaczmarek, and Steven Culp. Stacy Keach and Jane Kaczmarek star in this 1949 masterpiece by Arthur Miller, a searing portrait of the physical, emotional, and psychological costs of the American dream. Willy Loman (Keach) is the play's iconic traveling salesman, whose family is torn apart by his desperate obsession with greatness and social acceptance. As his two sons cast about aimlessly for their station in life, Willy begins to come unraveled when the reality of his life threatens his long-cherished illusions. L.A. Theatre Works' presentation of Arthur Miller's Death of a Salesman has been released on a two CD-set. Arthur Miller's Pulitzer Prize-winning play concerns a veteran salesman haunted by missed opportunities and a troubled past, whose life begins to unravel as he starts to lose faith in the two things he believes in: his family and his dreams. The company features Stacy Keach (Willy Loman), Jane Kaczmarek (Linda Loman), Steven Culp (Biff Loman), John Sloan (Happy Loman), Maureen Flannigan (Letta/Jenny), Jason Henning (Bernard/Stanley), Sam McMurray (Charley), Kathryn Meisle (The Woman), Tim Monsion (Uncle Ben), Kate Steele (Miss Forsythe), and Kenneth Alan Williams (Howard). * "Dr. Cerberus" as MP3 files for $4.95 on LearnOutLoud.com and also for $4.95 on Audible.com. * "Death of a Salesman" for $3.95 on iTunes. It will be available as MP3 files on LearnOutLoud.com soon. 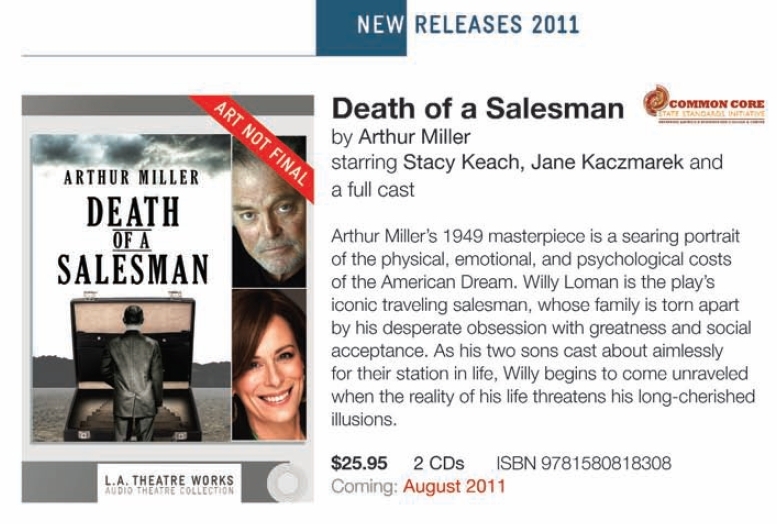 L.A. Theatre Works announced that Steven's latest radio play "Death of a Salesman" will be released on CD on August 15, 2011. The CDs can be pre-ordered at Amazon.com, Amazon.de, Amazon.ca, and Amazon.fr. 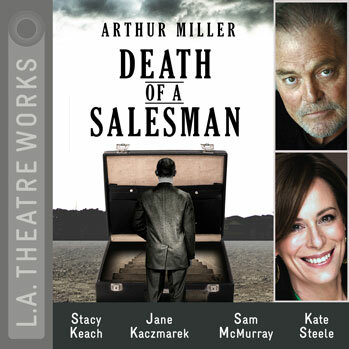 Golden Globe Award winner Stacey Keach takes on the role of Willy Loman in the L.A. Theatre Works production of Arthur Miller's Death of a Salesman, which begins performances March 16. 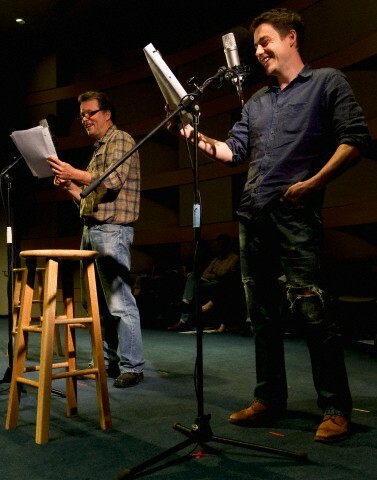 Lombardi playwright Eric Simonson directs the production that will run through March 20 at the Skirball Cultural Center. Keach, who recently starred in Jon Robin Baitz's latest play, Other Desert Cities, at Lincoln Center Theater, is joined by Jane Kaczmarek ("Malcolm in the Middle") as Linda, Steven Culp ("Desperate Housewives") as Biff and John Sloan (King Lear) as Happy. The cast also features Maureen Flannigan, Jason Henning, Sam McMurray, Kathryn Meisle, Tim Monsion, Kate Steele and Kenneth Williams. Simonson, a Steppenwolf Theatre Company member, is currently represented on Broadway with the football-centered play Lombardi. It was announced Feb. 17 that Magic/Bird, his account of the relationship between basketball players Larry Bird and Magic Johnson, will arrive on Broadway in 2012. 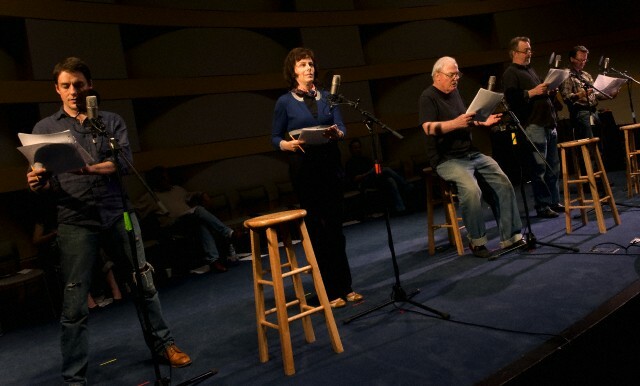 All productions are recorded and broadcast on LATW's nationally syndicated radio theatre series, "The Play's the Thing." 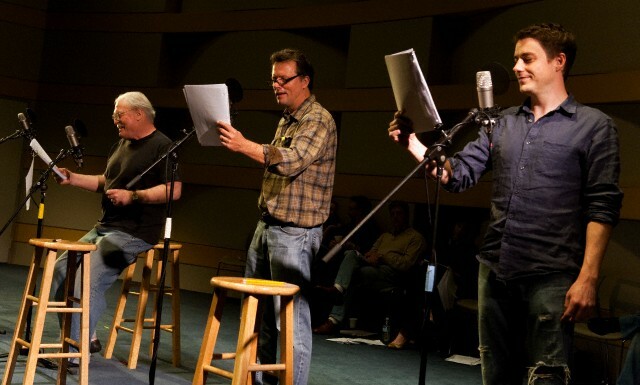 For tickets to any of "The Play's the Thing" productions at the Skirball Cultural Center, 2701 N. Sepulveda Boulevard, call the L.A. Theatre Works box office at (310) 827-0889. For more information visit latw.org. Casting is complete for L.A. Theatre Works' upcoming recording of Arthur Miller's Death of a Salesman, directed by Academy Award-winning filmmaker Eric Simonson. Stacy Keach heads the cast as Willy Loman, with Jane Kaczmarek as Linda Loman; Steven Culp as Biff Loman; and John Sloan as Happy Loman. Also in the cast are Maureen Flannigan, Jason Henning, Sam McMurray, Kathryn Meisle, Tim Monsion,; Kate Steele and Kenneth Williams. Five performances will be recorded March 16-20 at the Skirball Cultural Center for future radio broadcast; L.A. Theatre Works' nationally syndicated radio theater series airs locally in Southern California on KPCC 89.3 every Saturday from 10 pm - midnight and can be streamed on demand at www.latw.org. Employing stark realism, expressionism and archetypal characters with compassionate simplicity, Death of a Salesman remains one of American drama's most riveting and timeless works. Miller's devastating social commentary explores the pursuit of success and failure in the ever-shifting ideals of the American landscape. Willy Loman loses his tenuous grasp on reality as he struggles to achieve the noble dream of owning his home, suffering the terrible consequences of chasing after an illusion at the expense of his family and ultimately, himself. An instant critical success, Death of a Salesman opened in 1949 on Broadway's Morosco Theatre under the direction of Elia Kazan. Considered one of Arthur Miller's finest plays, it is a perennial favorite among theatergoers. The tragic figure of Willy Loman still looms large in the American consciousness, touching on the frailty and indomitable spirit of the human condition. As the shadow of Willy Loman continues to fall on stages worldwide, Death of a Salesman endures as a National Treasure for one lowly man to whom "attention must be paid." Death of a Salesman is the ninth Arthur Miller title to be recorded and preserved in the L.A. Theatre Works archive. 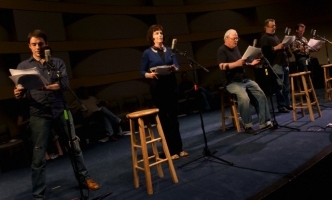 [...] In addition to radio broadcasts, the recordings are available for purchase on CD at www.latw.org and digitally on itunes. 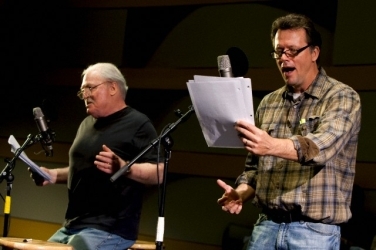 Steven Culp and John Sloan to Join Stacey Keach and Jane Kaczmarek for Death of a Salesman in L.A.
Steven Culp and John Sloan have joined the L.A. Theatre Works production of Arthur Miller's Death of a Salesman, starring Golden Globe Award winner Stacey Keach. 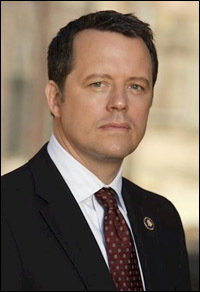 Culp ("Desperate Housewives") will play Biff, with Sloan (King Lear) as Happy. The cast will also feature Maureen Flannigan, Jason Henning, Sam McMurray, Kathryn Meisle, Tim Monsion, Kate Steele and Kenneth Williams. As previously reported, Keach, who recently starred in Jon Robin Baitz's latest play, Other Desert Cities, at Lincoln Center Theater, will step into the role of Willy Loman opposite Jane Kaczmarek ("Malcolm in the Middle") as Linda. 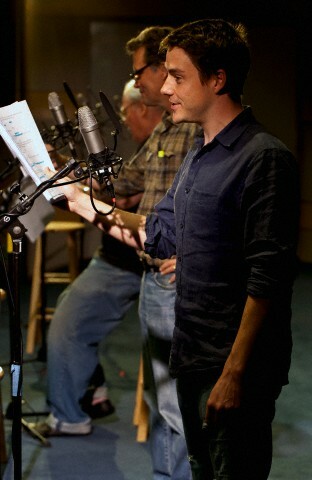 Eric Simonson will direct the production that will run March 16-20 at the Skirball Cultural Center. For further information visit latw.org. Complete casting has been announced for L.A. Theatre Works' presentation of Arthur Miller's Death of a Salesman, to perform at the Skirball Cultural Center March 16-20. Eric Simonson will direct the performances. 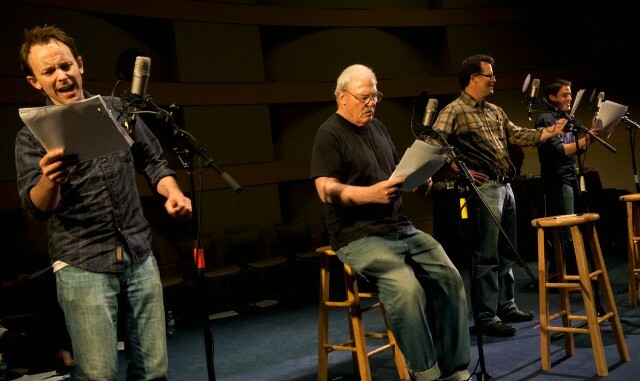 Along with the previously announced Stacy Keach (Willy Loman) and Jane Kaczmarek (Linda Loman), the company will feature Steven Culp (Biff Loman) and John Sloan (Happy Loman), along with Maureen Flannigan, Jason Henning, Sam McMurray, Kathryn Meisle, Tim Monsion, Kate Steele, and Kenneth Williams.